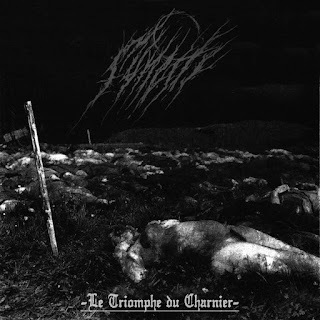 Funeste are a duo from Montreal, Quebec, Canada that plays dissonant form of black metal with elements of funeral doom and psychedelia and this is a review of their 2015 ep "Le Triomphe du Charnier" which will be released in August by Black Element Productions. Dark psychedelic effects start off the ep along with some acoustic guitars a few seconds later that use a decent amount of finger picking as well as having an ambient background and after the intro the music gets a lot more heavier and goes for more of a black metal sound and also brings in melodic riffs and guitar leads. When vocals are added into the music they are grim black metal screams and the music also goes into a very fast and raw musical direction along with a great amount of blast beats while the slower sections bring in a touch of funeral doom and there is also a brief use of spoken word parts and the songs bring in a great mixture of slow, mid paced and fast parts and the music also gets very atmospheric at times and the last track is very long and epic in length. Funeste plays a style of black metal that is very raw and dissonant bringing back a bit of the early 2000's style and also adds in a touch of ambient, psychedelia and funeral doom to stand out a bit more, the production sounds very dark and raw while the lyrics are written in French and cover misanthropy, anxiety and death. In my opinion Funeste are a very great sounding dissonant black metal band and if you are a fan of this musical genre, you should check out this ep. RECOMMENDED TRACK "Le Passager Invisible". 8 out of 10.